The link offers two providers. Some older articles are available via the Academic OneFile website with recent issues available on the PocketMags website. You need a separate username and password to access PocketMags. On the PocketMags website, select Login and enter the username and password you noted down in Step 1. 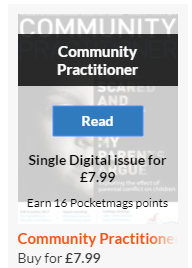 To read Community Practitioner on a phone or tablet, you'll need to download an app. There are links to install the apps you need on this Read Now page.